There is much happening around the world.. some natural and beyond the control of man and some very much in his power yet uncontrolled. In a time when the papers have no dearth of tragedies to report, it sometimes feels rather callous to go on about elegant flavors and all the good food that we are making and enjoying. I am appalled ever more everyday by the geo-political disasters that have been quaking around the globe. The occurrence of these distinct yet unsettling catastrophic events, does indeed seem almost way too much of a poetic coincidence. What happened in Japan and is happening in Libya are surely uncorrelated but that some form of upheaval is happening in quick succession across disparate geogrpahies, does indeed question man's presumption of being in control and the supreme being on Earth. Yet, for time immemorial, food has provided solace in difficult times and will continue to do so. From sniffles to major maladies, food has the power to heal the body, heart and soul. And, as the timing of events continue to elude reasoning, I can only pray for those in pain and comfort myself by taking care of my family with love and food. Garlic confit is truly a comfort. Poaching the garlic slowly in oil removes the pungence completely and renders it succulent and mildly sweet. 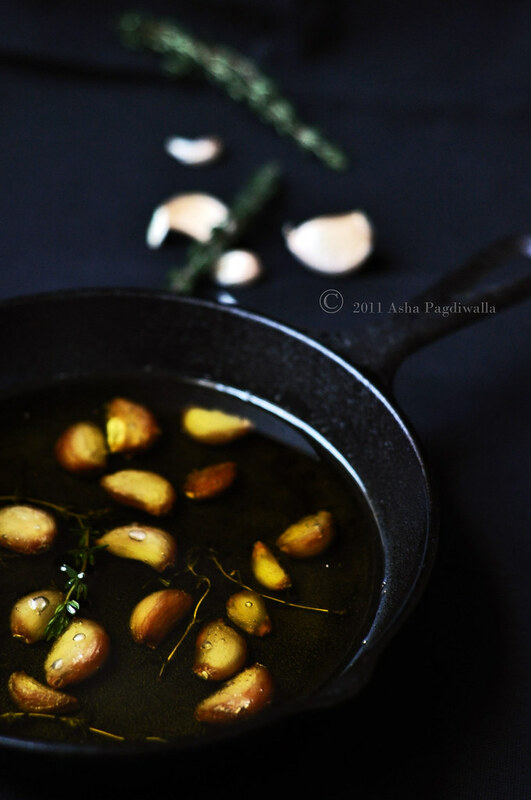 The garlic becomes so soft that you can just mash with the back of a spoon and the oil is perfumed with its flavor. I used thyme to add another aromatic depth of flavor. It is just delicious spread on a slice of toast. I recently picked up a pasta maker from CSN. It isn't a fancy model, just a small, handy perfect for the NYC apartment. 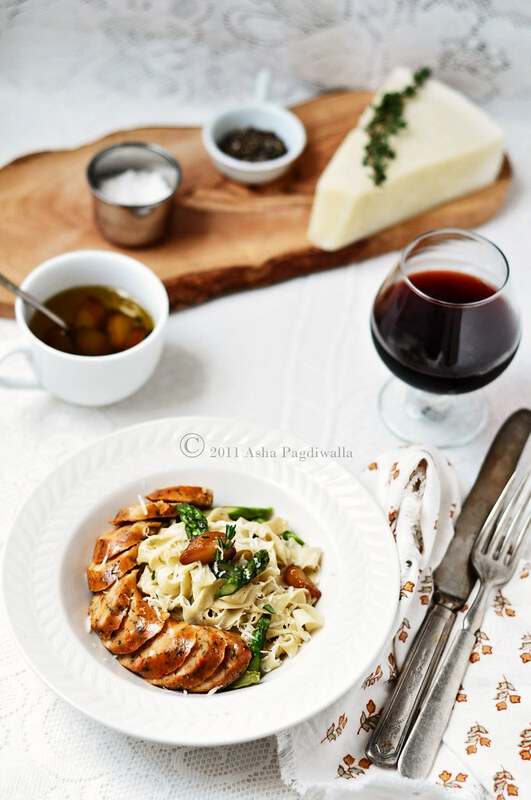 What a beautiful piece of simplicity it is and the pasta is just fabulous. 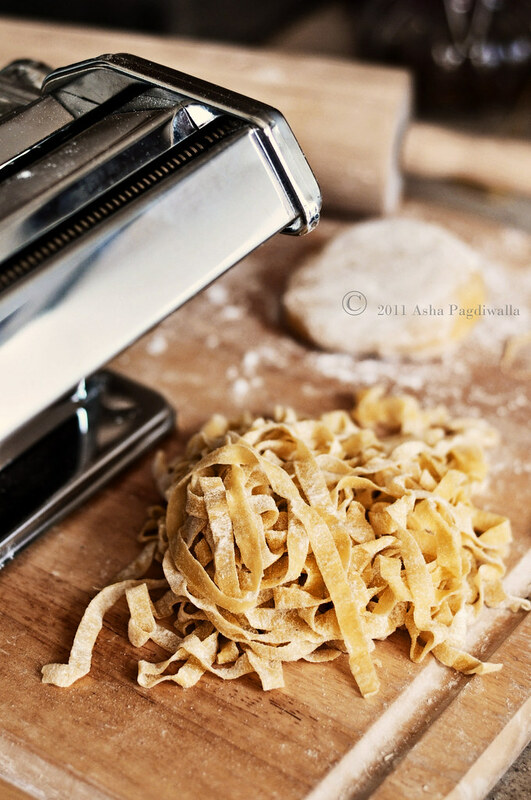 I have made pasta before at home by rolling it out by hand but the machine not only makes the process easier but also make for a even pasta that has the perfect texture. With Spring just around the corner, the first shoots of it are already available in stores. 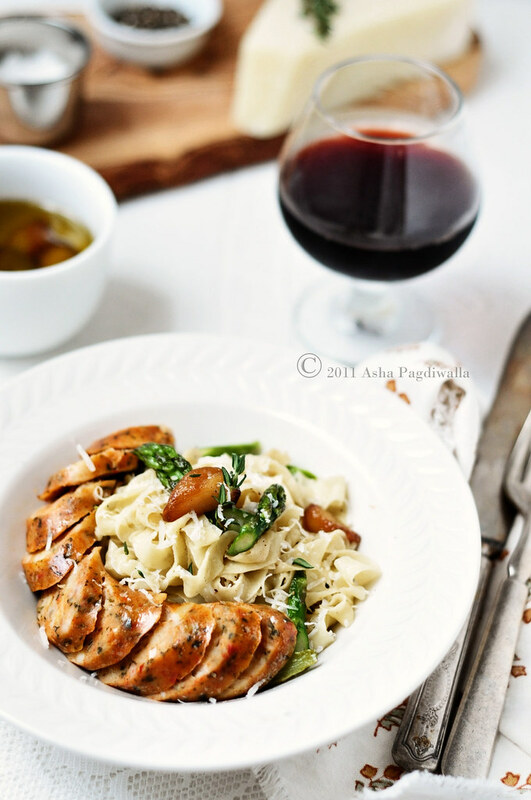 Asparagus, fresh, young and delectable brightens up any pasta lending it flavor and crunch. Paired with juicy seafood sausage and tossed in the oil from the garlic confit, it is a burst of flavors in your mouth! Bon Apetit! And stay safe. Hoping for peace soon. Combine all the ingredients in a oven safe dish and bake at 300 F for 50 minutes until the garlic is browned and completely soft yet holding shape. Let cool to room temperature and store in an airtight container. Bring a pot of water to boil. Drop the sausages in and cook for 8-10 minutes. Remove and reserve until serving time. Salt the same water generously and drop the pasta. Fresh pasta is ready when it rises to the top in about 2-3 minutes. Do not overcook, it becomes mushy. Drain the pasta but reserve the water. And the asparagus and blanch for a minute. Remove and slice on the bias. Meanwhile heat the oil from the garlic confit in a pan along with the fresh thyme. Add the asparagus and saute for a minute. Add the cooked pasta and toss gently. 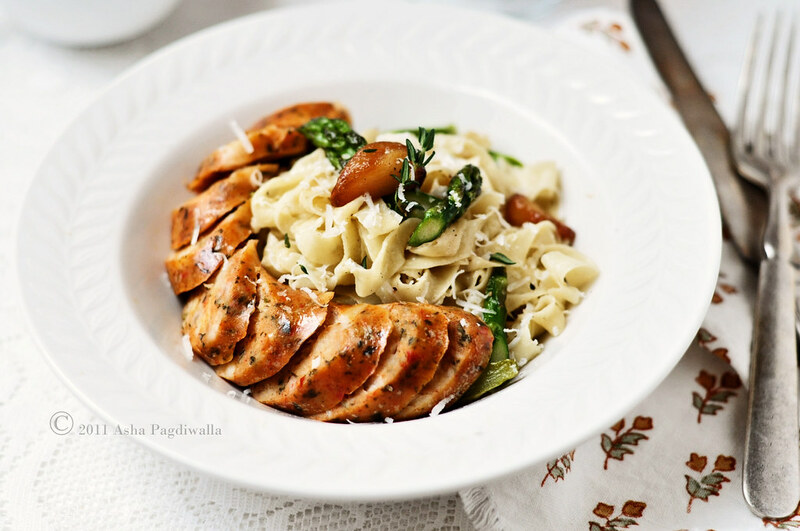 Divide the pasta into bowls, slice and arrange the sausage, sprinkle some of the garlic and garnish with parmesan. Serve with more confit on the side.